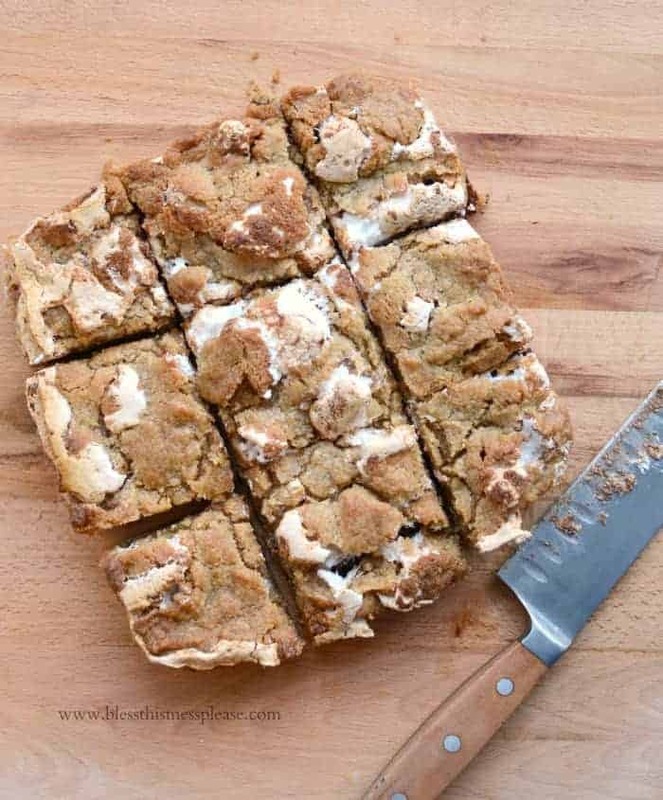 Nutella S’mores Bars that are made with graham crackers, marshmallow fluff and of course Nutella! Raise your hand if you are a Nutella lover! Both hands are over my head and I’m waving them like a crazy person. Nutella is a dangerous thing to keep in my house because I just can’t walk away from it. My kids love it too. My very favorite way to eat it is straight out of the jar on a pretzel. Seriously, Nutella and pretzels is the best sweet and salty combination ever. 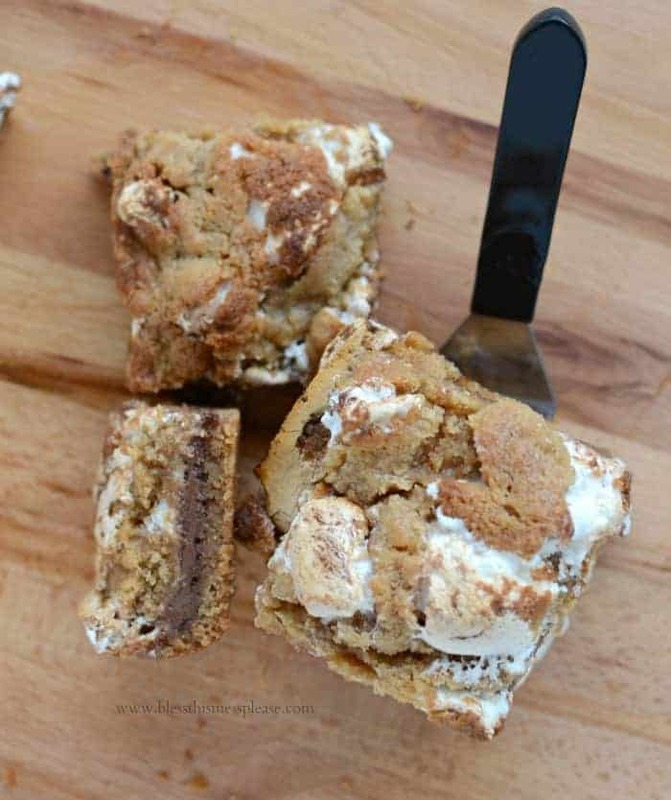 I’m celebration World Nutella Day with this AMAZING Nutella S’mores Bar recipe just for you. This recipe. You guys. This recipe! 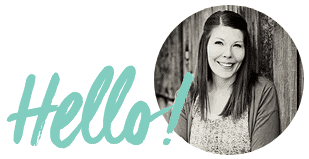 I’ve been super busy behind the scenes working on some big changes for Bless this Mess. Some of these changes have made me really sit down and define my brand and what I’m doing here. I love whole foods and eating well but part of me just can’t let go of a perfect dessert. Balance in ALL things! Part of me thinks that doing only “real” or “whole” foods would be great but I need dessert in my life. Even if it’s only occasionally, it’s part of who I am and who Bless this Mess is! So today I’m sharing this pretty perfect dessert with you and I think you should make it ASAP. If you are going to eat a treat, this should be it. I love that is only makes an 8-inch square pan (instead of a 9 by 13 inch pan) because you will eat the whole thing. These bars a sweet, rich, and amazing. The marshmallow fluff that is peaking out under the top layer of dough gets all cooked and brown. The Nutella is such a fun chocolate without being too much. 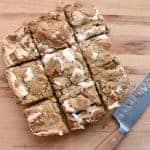 The dough has graham crackers in it. 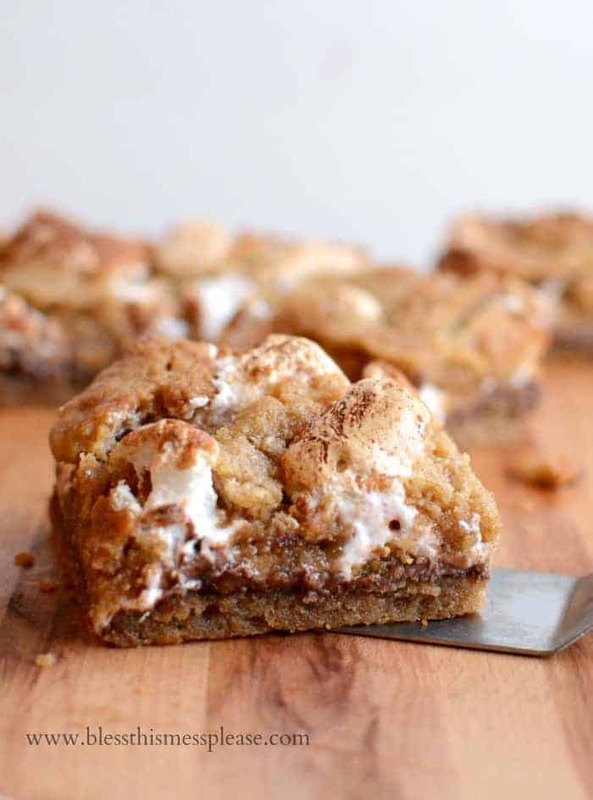 This is the best S’mores recipe out there and the best Nutella recipe around. The best of two very delicious worlds. Bake for 35 to 40 minutes until a toothpick inserted in the center comes out with no cookie dough stuck to it. Let the bars cool before serving. If you are planning on removing them from the pan to cut and serve let them cool at least 4 hours before cutting. No Nutella on hand, replace it with 1/2 cup peanut butter and 1/2 cup chocolate chips. SO GOOD! How many jars of Nutella are sold every year? A jar is sold every 2.5 seconds globally. Preheat the oven to 350 degrees and spray an 8 inch square baking dish with cooking spray, or make a foil sling and spray the foil with cooking spray (If you want to take the bars out of the pan to cut and serve I’d use the foil sling. If you plan on serving out of the dish, then you can skip that step). In a food processor or a blender add the graham crackers and blend until you have made smooth crumbs. Add the flour and salt and blend to combine. In a medium bowl or the bowl of your stand mixer add the butter and brown sugar and beat until light and fluffy, about 3 minutes. Add the vanilla and the egg and beat until well combined. Add the cracker crumb mixture and stir until just incorporated. Place 2/3 of the dough in the bottom of the prepared dish and press it flat with your hands or the bottom of a greased measuring cup. Add the Nutella and spread if around to cover the dough. Add the marshmallow fluff and spread it around to cover the Nutella. Place the remaining dough over the top in small pieces, it’s ok if you can see marshmallow fluff poking out. 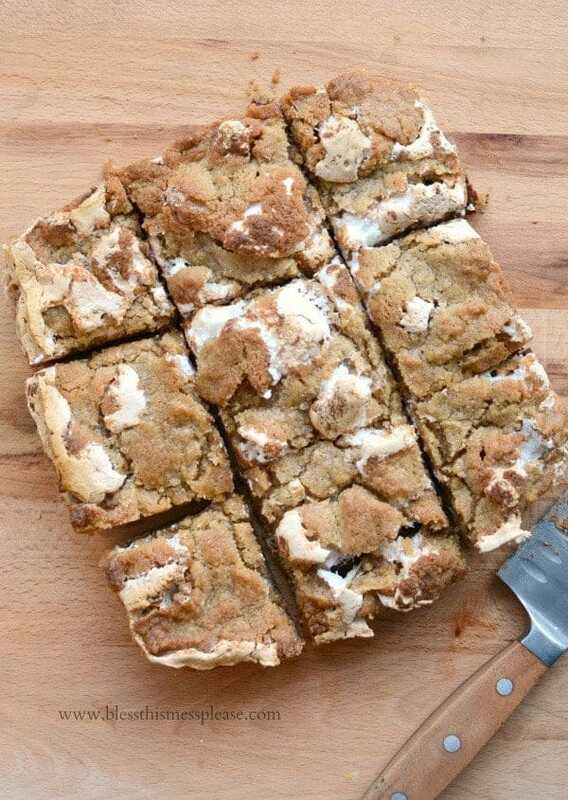 Thank you for stopping in and long live the Nutella S’mores Bars! Eat all the Nutella S’mores!!!! These sound sinfully delicious! And I don’t know how I’ve never tried Nutella with pretzels, but that is going to be my afternoon snack today! Yum! I love Nutella. I have the giant “happy” sized jar in my cabinet. My favorite combo is Fritos and Nutella. Seconded by Pretzels and Nutella. How much would it be if I used the pre-crushed graham crackers? Thanks! Hmmm? Maybe a little more than a cup? It’s about 5 ounces in weight. Melissa you are an evil diet saboteur. 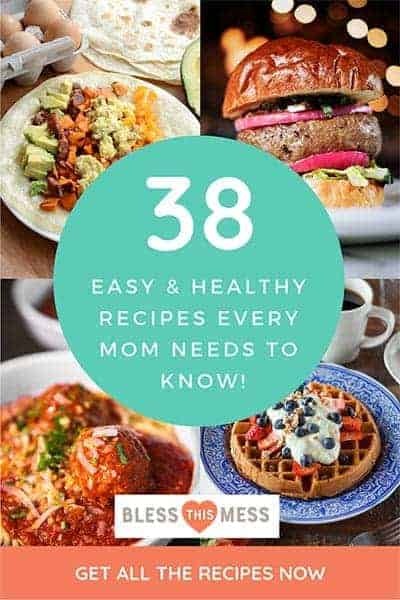 I seriously gained weight just reading the recipe. Going to have to try it. I love you to pieces.